Below you fill find all funeral homes and cemeteries in or near Manheim. Suburbs of Manheim: Elstonville, Elwyn Terrace, Lancaster Junction, Mastersonville, Mount Hope, Old Line, Sporting Hill. 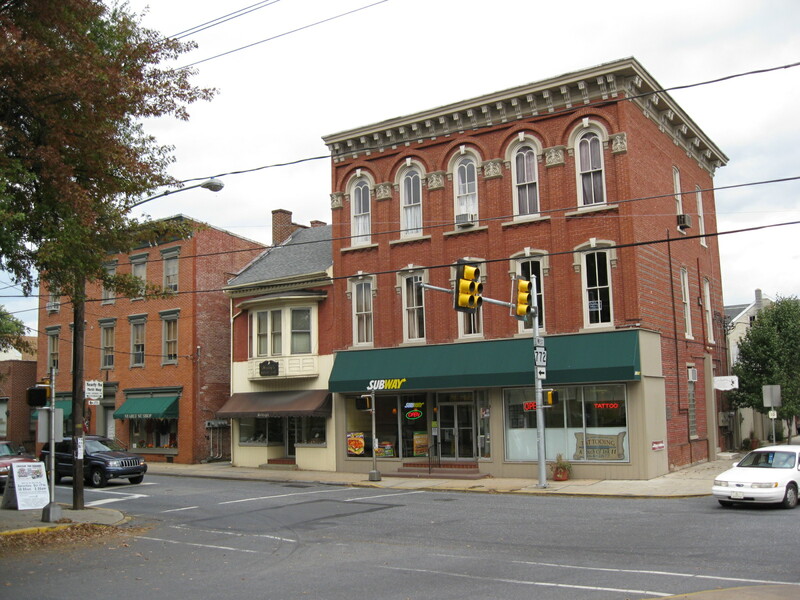 Manheim is also known as: Lancaster County / Manheim borough. Zip codes in the city: 17545. Some of the notable people born here have been: Dan Kreider (american football player), and Jeff Smoker (american football player). Manheim (Pennsylvania Dutch: Mannem) is a borough in Lancaster County, Pennsylvania, United States. The population was 4,858 at the 2010 census. The borough was named after Mannheim, in Germany. It was noted on September 6th, 2017 that Hillane Adele Sempier (Hahn) passed on in Manheim, Pennsylvania. Ms. Sempier was 70 years old. Send flowers to express your sympathy and honor Hillane Adele's life. It was disclosed by Sarasota Herald-Tribune on May 18th, 2017 that Doris Fay Gelder (Liddick) died in Sarasota, Florida. Ms. Gelder was 89 years old and was born in Manheim, PA. Send flowers to express your sympathy and honor Doris Fay's life. It was reported by The Sentinel on April 14th, 2014 that Patricia I "Pat" Imes (Imhof) passed away in Manheim, Pennsylvania. Ms. Imes was 84 years old. Send flowers to share your condolences and honor Patricia I "Pat"'s life. It was noted by The Sentinel on April 11th, 2014 that Christina Joy Miss Shanholtz perished in Manheim, Pennsylvania. Shanholtz was 33 years old. Send flowers to express your sympathy and honor Christina Joy Miss's life. It was disclosed by Altoona Mirror on April 2nd, 2014 that William D "Bill" Bonanno passed away in Manheim, Pennsylvania. Bonanno was 74 years old. Send flowers to express your sympathy and honor William D "Bill"'s life. It was noted by The Butler Eagle on March 2nd, 2014 that Gerard H Lavoie perished in Manheim, Pennsylvania. Lavoie was 91 years old and was born in Magog Quebec, . Send flowers to express your sorrow and honor Gerard H's life. It was written by Johnstown Tribune-Democrat on September 17th, 2013 that Janice Elaine Lambert (Wynn) perished in Manheim, Pennsylvania. Ms. Lambert was 66 years old. Send flowers to express your sorrow and honor Janice Elaine's life. It was reported by Lancaster Intelligencer Journal on August 14th, 2013 that Edna Brunk (Metzler) perished in Manheim, Pennsylvania. Ms. Brunk was 86 years old. Send flowers to express your sorrow and honor Edna's life. It was noted by Lancaster Intelligencer Journal on April 30th, 2013 that Rufus F Rohrer passed away in Manheim, Pennsylvania. Rohrer was 88 years old. Send flowers to share your condolences and honor Rufus F's life. It was disclosed by Lancaster Intelligencer Journal on April 15th, 2013 that Robert A Kauffman perished in Manheim, Pennsylvania. Kauffman was 65 years old. Send flowers to express your sympathy and honor Robert A's life. After financial failure, he was forced to sell the development in 1775. The population was 4,784 at the 2000 census. In 1884, another forward step was the laying of water pipes and the beginning of service by the Manheim Electric Company, which set up a plant in Bomberger's Mill at the end of Mill Street. He set out to build an industrial empire and founded the Manheim Glassworks. The Borough of Manheim is often confused with nearby Manheim Township, Lancaster County, Pennsylvania Township - a separate municipality. Manheim was laid out by Henry William Stiegel in 1762 on a land tract in Rapho Township, Pennsylvania, though it wasn't incorporated until 1838. Listing all funeral homes in Manheim, Pennsylvania so you can easily send flowers to any location (same day delivery) or find any funeral service. Manheim Funeral planning made easy! Learn how to pre-plan your funeral in Manheim, Pennsylvania, including step-by-step directions. We work with local florists and flower shops to offer same day delivery. You will find budget sympathy flowers in Manheim here. Our funeral flowers are cheap in price but not in value. How to Ask for Time Off for a Funeral?